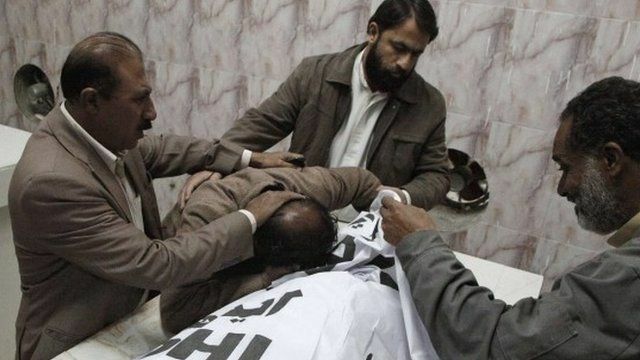 Polio workers killed in Pakistan Jump to media player Authorities in Balochistan, Pakistan, have suspended a campaign against polio after four workers were shot dead by unidentified gunmen in the city of Quetta. Deadly attack on Pakistan polio team Jump to media player At least 11 people have been killed in a bomb attack in Pakistan, aimed at a polio vaccination team. Pakistan polio outbreak 'uncontrolled' Jump to media player As the World Health Organization declares the recent spread of polio an international public health emergency, Kim Ghattas reports from Pakistan, which is suffering an 'uncontrolled outbreak'. Pakistan 2015 polio eradication hopes Jump to media player Pakistan's polio guru, Ayesha Farooq, on the challenges the Taliban poses in eradicating the disease from the country by 2015. Security for polio workers in Pakistan Jump to media player The number of cases of polio in Pakistan has topped 200 for the first time in nearly 15 years. CIA 'ends use of vaccine programmes' Jump to media player The CIA has ended the use of vaccine programmes in its spying operations amid concerns for the safety of health workers, the White House has said. Authorities in Balochistan, Pakistan, have suspended a campaign against polio after four workers were shot dead by unidentified gunmen in the city of Quetta. More than 60 Pakistani polio workers, or their guards and drivers, have been killed since 2012 - with most attacks blamed on Islamic extremists. Shaimaa Khalil reports from Islamabad.